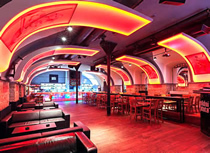 The fiery red walls and huge circular bar in the centre of Solidni Jistota give a very distinct first impression as you enter the club. It is a good one though, making this a popular venue with plenty of atmosphere and a real Saturday night party night feel. Solidni Jistota is a friendly, easy going club. The music is not too loud that you can't have a good conversation, but if you fancy a dance, the small dance floor is packed most weekend nights as the DJ blends together a decent mix of party tunes. Catering for the over 25's market, Solidni Jistota attracts a healthy mix of local Czechs, regular tourists and stag & hen nights. Although a brisk 5 minutes walk from the main nightlife areas, you can certainly fit Solidni Jistota in on a trip around the Prague hotspots. Combine your visit with a drink in the nearby Nebe Kremencova Cocktail & Music Bar.